Penny joined Flavours on a cooking short break in Tuscany. She’s tested out a few recipes from ‘Gino’s Healthy Italian for Less’ for us – a great book for a January health kick! The recipe was really easy to follow and the ingredients, although very few, created a fantastic flavour. My husband adored the dish and we think it would be a great starter or part of a main meal if entertaining a large group. We found that because Gino is creating dishes on a budget, he provides you with the elements of something really tasty but quite basic. The additional crunch of the toasted breadcrumbs was lovely and created an extra dimension to the dish. It was also interesting to cook the garlic in the oil and then discard once the flavour had become infused with the garlic taste. The recipes are simple, but I was learning new tricks as I went through them. We actually cheated in this dish and added fresh prawns and a touch of lemon at the very end which worked really well. 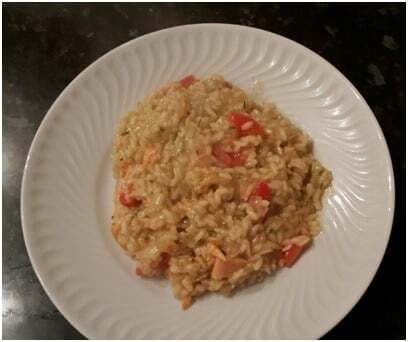 The steps for this recipe are simple to follow, and if you are accustomed to making risotto this is a quick and easy supper time dish to make. We really enjoyed the flavours and the tomatoes worked well in it. My husband did comment that perhaps a bit more texture and something green could add interest, but that would not be difficult to do. A very tasty dish which we would certainly eat again, perhaps with added courgette and spring onions as opposed to chives as may lend more texture and colour. I would recommend it to families who are cooking to a budget, and particularly working mothers who don’t have time to run about getting lots of ingredients. 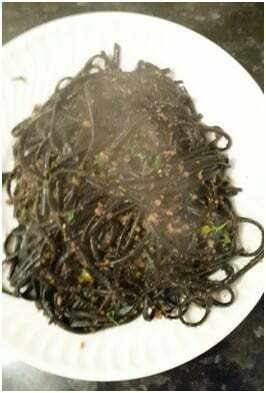 The dishes are simple enough that once tried you could add additional ingredients and create something perhaps a bit more special, but for a mid-week meal, or simple entertaining, the dishes we tried are great. I’ve already made a list of the other recipes I want to try, particularly the meat loaf and spiced grape cake with orange zest!